The world is full of unfathomably huge projects happening right under our noses. Take the Hong Kong-Zhuhai-Macau Bridge, which will link three major Chinese cities in the country's quest to bring 42 million people together. Or Norway's plan to build the world's first fully-submerged floating tunnel to cut travel times between fjords in half. Those efforts and many others illustrate how investing billions of dollars in enormous projects can collectively make the world a better place to live. Here are some of the biggest projects the world has seen so far. Completed in September 2016, China's Pingtang telescope is now the world's largest radio telescope. Its dish measures 1,640 feet across and is capable of capturing signals more than 1,000 light-years from Earth. After 17 years of construction, the Gotthard Base Tunnel opened in Switzerland on June 1, 2016. At 35 miles long, it's both the longest and deepest train tunnel in the world, offering unprecedented efficiency when traveling through the Alps. The newly expanded Panama Canal was unveiled to the public in early June, 102 years after it first opened. It took $5.4 billion and 40,000 workers to triple the capacity of the waterway. In 2026, an Iraqi skyscraper known as "The Bride" will feature a "veil" of solar panels and produce as much energy as it consumes. It'll be 3,779 feet tall and contain parks, offices, restaurants, and a rail system. Completed in 2011, China's Jiaozhou Bay Bridge is the world's longest cross-sea bridge, stretching nearly 26 miles — almost the length of a marathon. It cut travel time in half for people going between east China and the island of Huangdao. In 2015, the Itaipu Dam on the border of Brazil and Paraguay generated 89.5 Twh of energy, the most of any dam in the world. It supplies 75% of Paraguay's total energy and nearly 20% of Brazil's. London's Crossrail project — a massive upgrade to the existing Underground system — is the largest construction project ever undertaken in Europe. It involves 10 new train lines and connects 30 existing stations via brand-new tunnels. It will begin service in 2017, and be fully operational by 2020. Opened in South Africa in 2014, the Jasper solar farm produces roughly 180,000 megawatt-hours per year, capable of powering 80,000 homes. It is the largest solar power project on the continent. The Hyderabad Metro Rail is a 46-mile-long light rail system that will finally bring communication-based train control to India. It's due to be completed in 2017. The Hong Kong-Zhuhai-Macau Bridge project will link three cities in China's Pearl River Delta — creating one mega-city of 42 million people — when it's completed in 2017. Dubai's Mall of the World will be a colossal domed structure nine times bigger than the Mall of America. When it opens in 2029, it will be temperature-controlled, feature thousands of hotel rooms, and have its own transit line. Google's parent company, Alphabet Inc., is developing plans to create "Smart Cities" — redeveloped areas with complete Internet access, renewable energy, and the latest in automated technology — throughout the US. 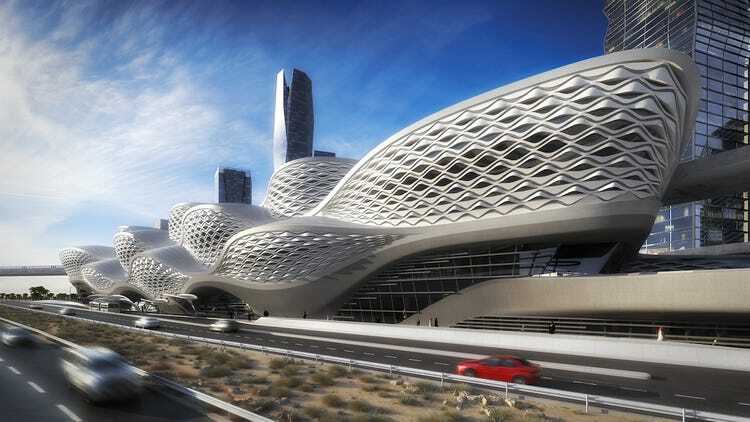 The Riyadh Metro, Saudi Arabia's new $23.5 billion rail line will boast a station designed by Zaha Hadid. Its 109 miles of railway will revolutionize how residents of Riyadh get around. It's set to begin operation by 2019. Songdo, South Korea is a so-called "smart city" located on 1,500 acres of waterfront land. Completed in 2015, Songdo's near-comprehensive Internet access gives its 67,000 residents a taste of future society. Earlier this July, China and Nigeria agreed to a $11-billion contract to build the Lagos-Calabar coastal railway. It'll stretch for 871 miles and is expected to open in 2018. The South–North Water Transfer Project is an ongoing Chinese effort to move nearly 45 billion cubic feet of water from the Yangtze River to the country's less fertile northern regions. More than $79 billion has been spent on the migration so far. In July of 2016, Norway announced plans to spend a reported $25 billion on a fully submerged, floating tunnel beneath the Sognefjord, a body of water more than 4,000 feet deep and 3,000 feet wide. It would be the first of its kind in the world. The 20-year Turkey Urban Renewal Project, a far-reaching plan to demolish some 7 million buildings and rebuild earthquake-resistant structures in their place, began in 2012 with an estimated cost of $400 billion.